I will be the first to admit that I’m not crazy about the holidays. Sure, I enjoy a holiday gathering here and there and the lights all around Columbus Circle are pretty, but the imposed cheer can get to you – especially when it starts in early November. My favorite thing about this time of year are the small gifts: my colleague who makes and decorates beautiful gingerbread cookies each year, the lovely homemade candy that I wrote about in my last post, and the random and wonderful things my husband brings home from his work colleagues: olive oil, clementines and even a fancy bottle of gin. Between our colleagues, neighbors and teachers, there are a lot of people to remember this season and the challenge is to make something either beautiful or delicious . Our go-to gifts are biscotti and truffles, but this year I decided to go in a different direction. I love forcing bulbs in the winter, but since buying 50 amaryllis bulbs would exceed our budget, I decided to go with paperwhites – which are a nice reminder of spring in the middle of winter. 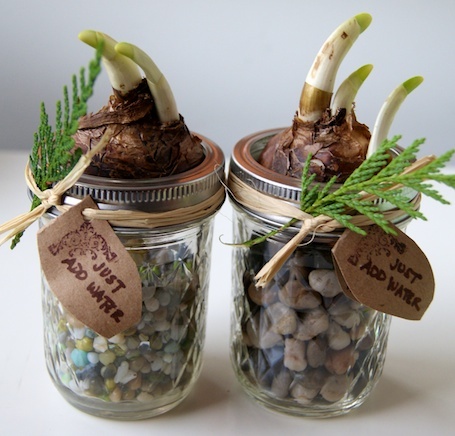 Paperwhite bulbs + mason jars + colorful stones = fun Saturday afternoon with our daughters. 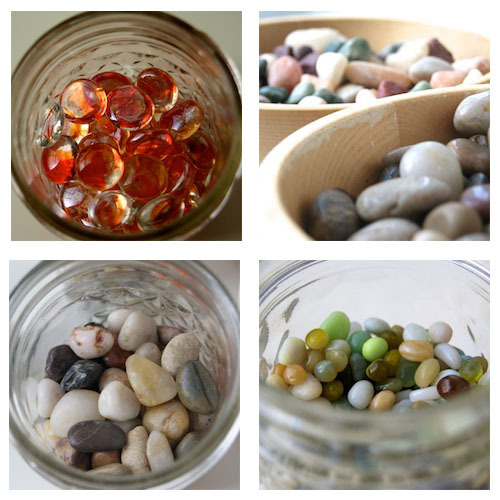 For what child doesn’t love to put rocks in jars? Dress with raffia, greenery and instructions and voilà: Happy Holidays! This entry was posted on December 24, 2011, 9:30 am and is filed under garden, kids, make. You can follow any responses to this entry through RSS 2.0. You can leave a response, or trackback from your own site. Those tasty truffles were the perfect Christmas Eve breakfast. I prefer gin in a fancy bottle. We did this for our teachers this year but didn’t use the Mason jars. I like them better. 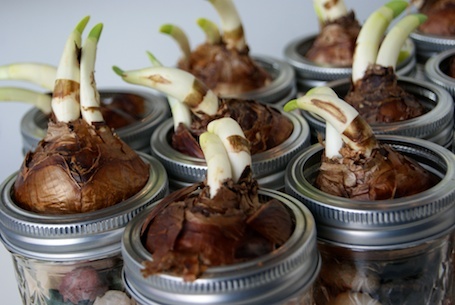 You need something with the weight of a jar at the base because these bulbs grow tall and tend to tip over if not supported properly. Thanks!